CZ has a new rifle that should appeal to varminters and target shooters. 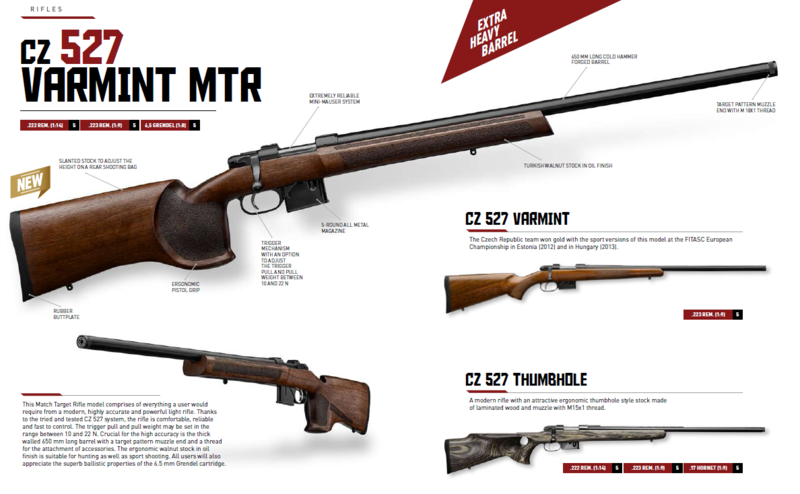 The new CZ 527 Varmint MTR (Match Target Rifle) is designed to provide enhanced accuracy with a heavy-profile barrel and stock that works well from bench or bipod. The MTR features a fast Mini-Mauser action with a trigger that adjusts from 2.25 to 4.95 lbs (10 to 22 N). Click above photo for full-screen image with legible notations. We wish we could tell you how the CZ 527 Varmint MTR shoots, but this rifle is so new that test samples haven’t made it to the USA yet. Based on experience with other CZ 527 models, we would expect about 1.2 MOA accuracy with decent factory ammo. With handloads you might get closer to 0.7 MOA for three shots. Sorry no USA price is available yet. 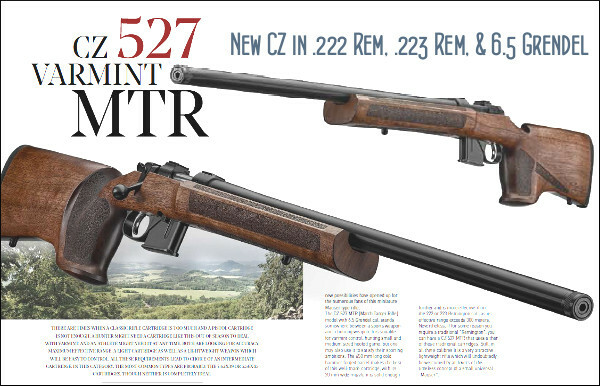 However, the older CZ 527 Varmint, with a lesser-grade stock, has an MSRP of $725.00, so we expect the CZ 527 Varmint MTR to retail for around $875.00. We note that the latest model CZ 557 Varmint with similar, ergonomic Turkish Walnut stock has an $865.00 MSRP as listed in the 2018 CZ-USA Catalog. — Match-type stock design with wider, straight fore-end for good tracking on front rest. 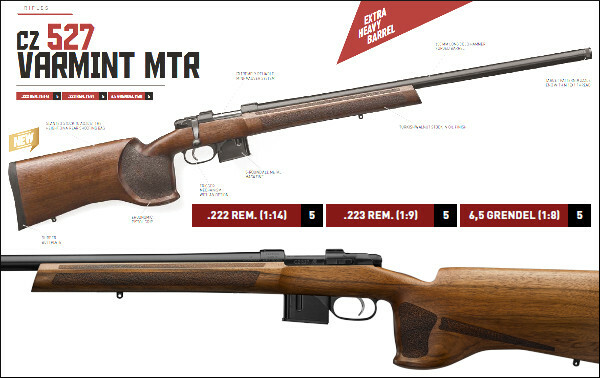 Share the post "New CZ 527 Varmint MTR (Match Target Rifle)"
The CZ-455 is very affordable, with a $389.55 street price. File photo shows Leupold scope. A different CZ 455 with Vanguard scope was used in CTD ammo test. How accurate can a sub-$400 rimfire rifle be with moderately priced .22 LR ammo? A lot better than you might expect. 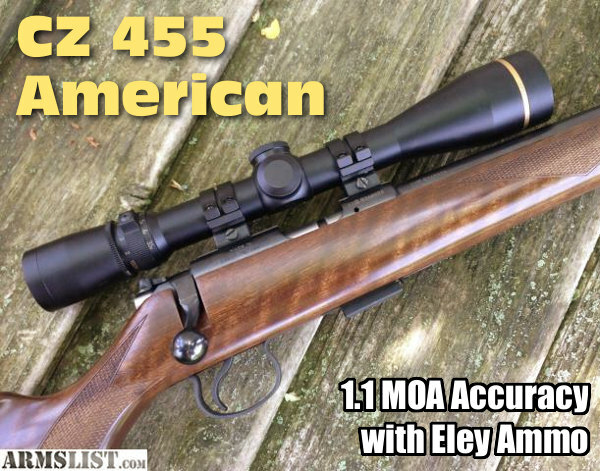 CTD Blog Tester Wilburn Roberts took a box-stock CZ 455 American and got 1.1 MOA accuracy with Eley Contact ammo, and 1.3 MOA accuracy with Fiocchi HV ammo. This was shooting from the bench with a $280 3-9x40mm scope and targets set at 50 yards. The actual Eley Contact 40gr average group size for three, 5-shot groups was 0.55″. That is pretty darn impressive for a very affordable rifle with no accurizing. Group sizes at 50 yards, listed in inches. The .55″ equates to 1.0506 MOA at 100 yards. Tester Wilburn Roberts was impressed with the CZ 455’s accuracy: “This is an accurate rifle, and I realized this with the first group. The rifle was fired for accuracy at 50 yards. The accompanying table (above) lists some of my results.” Along with target ammo such as Eley Contact, Roberts tested several hunting loads, such as the CCI Velocitor and Winchester Super X, that “have given good results on game”, according to Roberts. Read Full CZ 455 Review. Wouldn’t it be great if a rimfire rifle could shoot both .22 LR and .17 HMR? Well, CZ offers just such a rig — the CZ 455 American Combo, a versatile switch-caliber rifle priced under $500.00. The American Combo (MSRP: $557.00) comes complete with both .22 LR and .17 HMR barrels, easily interchanged with an Allen wrench. As CZ explains: “The CZ 455 eliminates the need to spend the extra expense on a second rifle when you want to add another quality shooter to your rimfire battery”. For a bit more money, you can even purchase a .22 WMR barrel, making your CZ a triple-threat varmint-slayer. As tested by GunsAmerica.com, the CZ-455 has shown impressive accuracy in both .17 HMR and .22 LR versions. In fact, when GunsAmerica.com tested the CZ 455 American Combo, the .17 HMR version delivered quarter-inch groups at 50 yards. That’s darn impressive accuracy! Share the post "CZ 455 .22 LR Rifle Ammo Comparison Test"
Any experienced varmint hunter knows the value of a good .17 HMR rifle, particular when used inside 150 yards on small critters such as ground squirrels. The .17 HMR is a great round, but for general plinking and target practice, we prefer shooting the venerable .22 Long Rifle. The .22 LR has less recoil and less noise. Importantly, .22 LR ammo (even with today’s shortages) remains much less expensive than .17 HMR ammunition. Wouldn’t it be great if a single, affordable varmint rifle could shoot both .22 LR and .17 HMR? Well, CZ offers just such a rig — the CZ Model 455 American Combo, a versatile switch-caliber rifle priced at about $485.00 (MSRP is $531.00). The American Combo comes complete with both .22 LR and .17 HMR barrels, easily interchanged with a simple Allen wrench. As CZ explains: “The CZ 455 eliminates the need to spend the extra expense on a second rifle when you want to add another quality shooter to your rimfire battery”. For a bit more money, you can even purchase a .22 WMR barrel, making your CZ a triple-threat varmint-slayer. 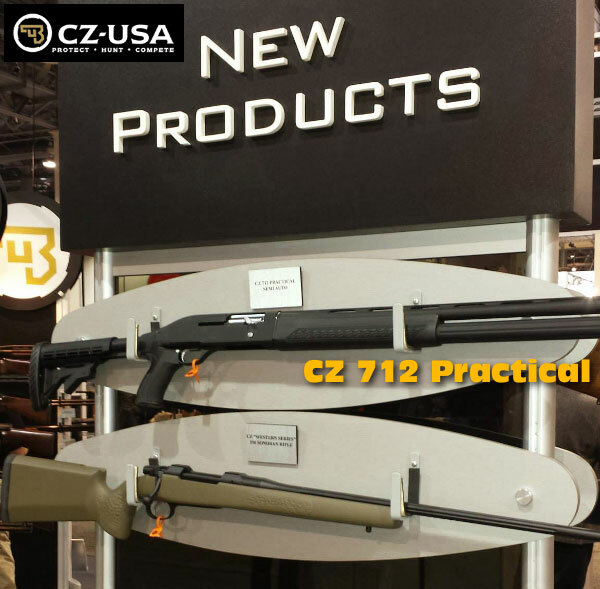 Share the post "CZ Model 455 .17 HMR and .22 LR American Combo Rifle"
CZ USA had many new (and updated) products on display at SHOT Show 2014. 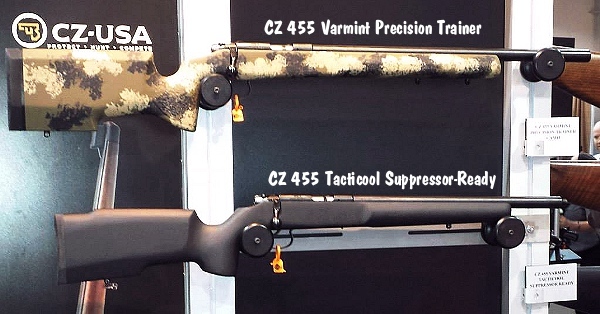 A new camo version of the CZ 455 Varmint Precision Trainer (VPT) caught our eye. This is one of the best options for Rimfire Tactical Competitions, and well as cross-training with low-cost rimfire ammo. Chambered in .22 LR, the Varmint Precision Trainer was designed to provide the same look and feel as a full-size tactical rifle while allowing for more economical training. The high-quality Manners Composite T4 stock wears a new camouflage paint scheme this year. The rifle features an .866-diameter heavy barrel that should offer good accuracy. MSRP is $940.00. The black-stocked rifle below the camo VPT is another interesting rimfire from CZ. New for 2014, this CZ 455 Tacticool Suppressor-Ready sports a 16.5″ varmint-contour barrel with 1/2×28 threads for the “can”. This allows easy installation of your suppressor, while allowing a short overall package. For varmint hunters who want a quiet, stealthy rifle, this model fills the bill. NOTE: CZ does NOT provide the suppressor. That must be purchased separately and an ATF tax stamp must be obtained. Check the laws in your jurisdiction to determine whether suppressor ownership is legal where you live. 3-Gun Competitors will be impressed with CZ’s new scattergun, the 712 Practical. Priced at an affordable $699.00 (MSRP), this semi-auto shotgun, designed specifically for 3-Gun competition, features 10-round capacity (counting a shell in the chamber). The 6-position, adjustable buttstock offers various lengths of pull from 11.25 to 15 inches. The ATI fluted magazine extension provides 9+1 rounds of firepower and extends just past the 22″ barrel to help protect the muzzle. The new 712 Practical comes complete with 5 choke tubes — all for a price that undercuts some comparable 3-Gun shotguns by hundreds. Share the post "New Rimfires and 3-Gun Comp Shotgun from CZ for 2014"
Legendary exhibition shooter Tom Knapp, “The Shooting Star”, passed away yesterday. Tom was an inspiration to generations of shooters and he will be missed. Tom performed some truly amazing feats, including tossing ten (10) clay birds in the air, and then hitting them all with ten separate shots in 2.2 seconds! Tom started performing for the public in 1987, and he gave shooting exhibitions around the world. He was also a popular “featured guest” on many hunting/shooting television shows. Share the post "Exhibition Shooter and Video Host Tom Knapp Passes Away"
CZ (Česká Zbrojovka), the Czech arms-maker, produces some fine, affordable rimfire and centerfire rifles, including the popular CZ 452 (rimfire) and CZ 527 (small centerfire cartridge). CZ-USA now has a new version of its CZ 455 rifle that is ideal for tactical rimfire games and small-bore cross-training. 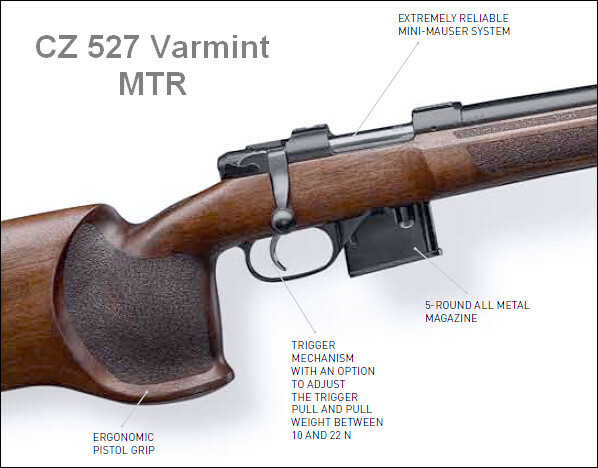 The new-for-2012 CZ 455 Varmint Precision Trainer (VPT) features a CZ 455 action, with .866″ diam. heavy barrel, in a rigid, high-tech Manners Composite stock. Rounds feed through reliable (and affordable) detachable magazines. The 455 VFT’s list price is $899.00 but expect street price to go lower. This rifle is brand new, so you may have to wait a few weeks on delivery. Stock-maker Tom Manners told us: “We just delivered the first production run of stocks, and CZ is putting the guns together right now”. The 455 VPT offers the same look and feel of a full-size tactical rifle. This 455 uses a Manners MCS-T4 stock assuring a rock solid platform for the 455 barreled action. The outer shell of the MCS-T4 is made with carbon fiber and fiber glass in multiple layers. The stocks can be custom-ordered with a heavy fill to match your current rifle weight to truly duplicate its feel. Only one color, Coyote Tan, is currently available, but we think this will be popular with most shooters. Tom Manners noted that versions of the CZ 455 VPT stock design can also be purchased separately and used with other barreled actions: “The 455 VPT stock is based on our MCS-T4 design. We offer this, fully inletted with pillars, for a variety of rimfire actions: Sako Quad, Savage Mark II, CZ 452, CZ 453, along with the 455.” Inletting is complete, so this will be a drop-in solution if you already own one of the listed rimfire rifles. Tom says: “With this stock, some guys will bed the rear area of their action, but that’s not necessary — you can pretty much bolt ‘em in and go”. Regular price for the Manners MCS-T4 rimfire stock is $475.00. However, if you mention AccurateShooter.com, Manners Composite Stocks will take five percent (5%) off that price through the end of January. That reduces your cost to $451.25 before options. We really like the thinking that went into the CZ 455 VPT rifle. We believe there’s a market for a very accurate varminter/tactical trainer in a high-quality modern stock optimized for prone and bipod work. We hope to do a hands-on test of the CZ 455 VPT at SHOT Show Media Day next week. Share the post "New CZ 455 ‘Varmint Precision Tactical’ Rifle in Manners Stock"
The new red and black model 200 S air rifle from CZ-USA is an excellent deal at $429.00 MSRP. Expect to find this at discounters for around $399.00. For that price you get a modern, ergonomic three-position stock, an nice adjustable 2-stage trigger with low pull weight, and a 4x32mm scope. The action also has dovetails to mount iron sights. Offering 16 Joules of energy from its gauge-equipped air cylinder, the 200 S airgun will launch .177 caliber pellets at 800 FPS. As Kelly Bachand explains in the video below, this rifle offers plenty of bang for the buck. Kelly says he has “spent a lot more money for an air rifle with far fewer features.” If you are looking for a training rifle for your club or organization, the CZ 200 S would be a good choice. Kelly feels this air rifle is a real winner for the price. As this website’s Editor, I see hundreds of rifles at SHOT Show. 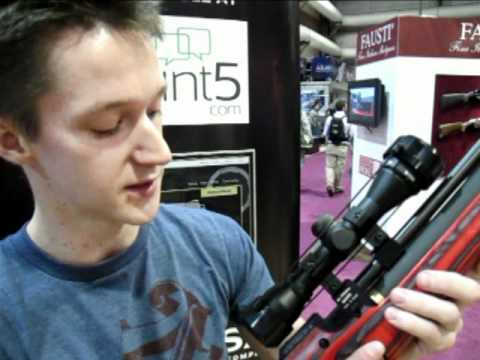 If there was one rifle I wanted to purchase and take home from this year’s Show, it was the CZ 550 FS (see video above). 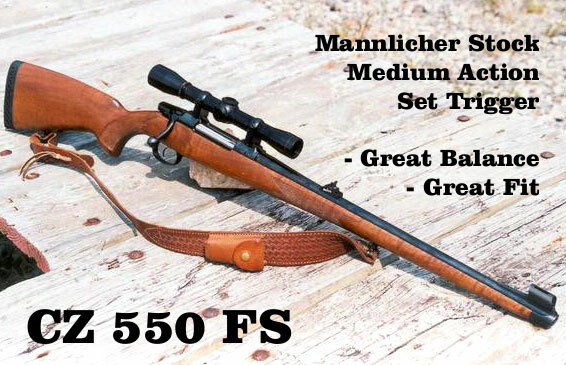 A 7.2-lb Mannlicher-stocked field rifle, with 20.5″ barrel, this gun fit me like a dream. Equipped with safari-style iron sights, the rifle mounted and indexed perfectly. The sights seem to align themselves. The instant I shouldered the rifle with my cheek on the rounded Euro-style comb, the front bead-tipped blade indexed perfectly in the rear v-notch. I could literally mount this rifle to my shoulder with my eyes closed, then open my eye and find the safari sights were perfectly aligned both vertically and horizontally. That’s remarkable. Watch the above video — the CZ 550 is covered in the second half. The action is very smooth — much better than most domestic factory guns, and noticeably smoother than a Tikka T3. The top of the action has a 19mm dovetail for secure, low-profile mounting of scope rings. 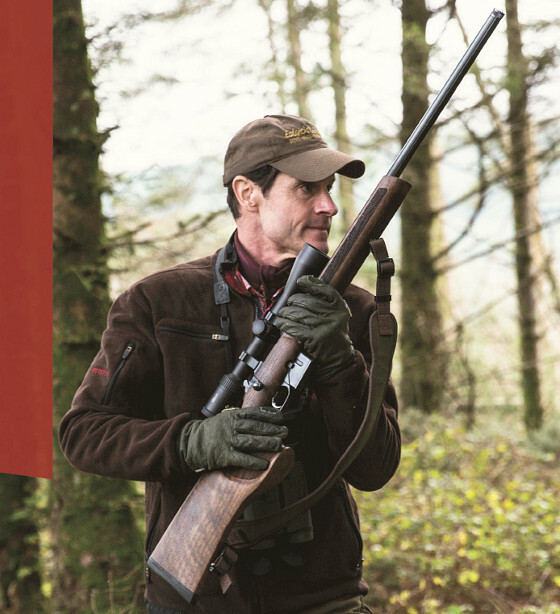 The 550 FS comes with a handsome Turkish walnut stock, fitted with proper sling swivels. This rifle has been very popular with owners, and I can understand why — it’s light, easy to handle, and it is one of the best-pointing hunting rifles I’ve ever shouldered. The model 550 FS is offered in a variety of calibers: .243 Win, 6.5×55, .270 Win, .308 Win, 30-06, and 9.3x62mm. Note, for 2011, CZ is offering a Mannlicher-stocked rimfire rifle chambered in .17 HMR, the CZ model 452 FS, priced at $514.00 MSRP. That would be a great carry-around varminter for squirrels and small game. 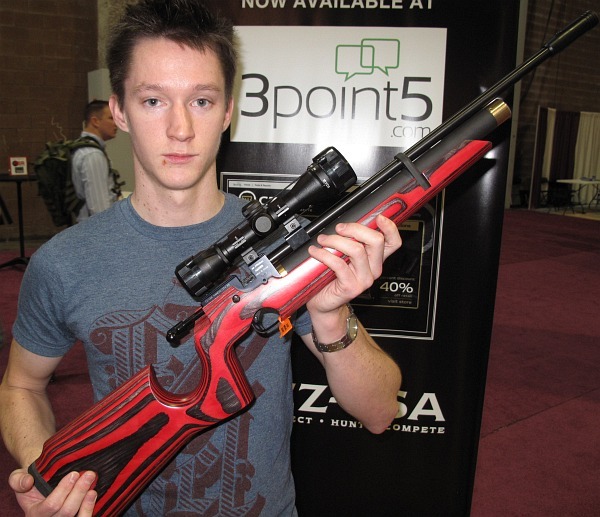 Share the post "SHOT Show Report: Something Old, Something New from CZ-USA"